I've talked several times on this blog about not wanting to throw away food. However, sometimes it can be too much effort to deal with certain ingredients. Case in point, what on Earth would you do with 12 egg yolks? Yes, of course there are many desserts that require a large amount of egg yolks, or you can make mayonnaise. But that just did not sound like something I wanted to deal with a few weekends ago. And so I turned to Twitter for suggestions. The most popular reply was "make ice cream." Yes, a valid suggestion, but I don't have an ice cream maker. One time I did attempt to make ice cream sans the ice cream maker, and although the flavor was great, the texture was rather mediocre. When Stacey Viera suggested I make ice cream, I told her she can just come over and pick up the egg yolks and make her own ice cream! Well, Stacey agreed and sent her husband to pick up the egg yolks with a promise to share some of the ice cream with me. Perfect. At first, Stacey planned on making chocolate ice cream: I was thrilled. I love chocolate, but only the dark variety, and was looking forward to the results of Stacey's work. But then she changed her mind! She decided to make salted caramel ice cream. You can read about her thoughts here. And for a full recipe, check out this link. So what did I think about this salted caramel ice cream? I was actually pleasantly surprised. The flavors reminded me of caramel corn. Stacey also gave me a little bag with shaved salt to sprinkle on top of the ice cream, which provided a great contrast. My friend Jenn was over at my place, and I was happy to share the ice cream with her. At the end, would I order this at an ice cream parlor? Unlikely, but I was thrilled to try a new flavor and can't wait to sprinkle some of the salt on savory dishes. Thank you Stacey for rescuing the egg yolks and sharing the sweet results with me! 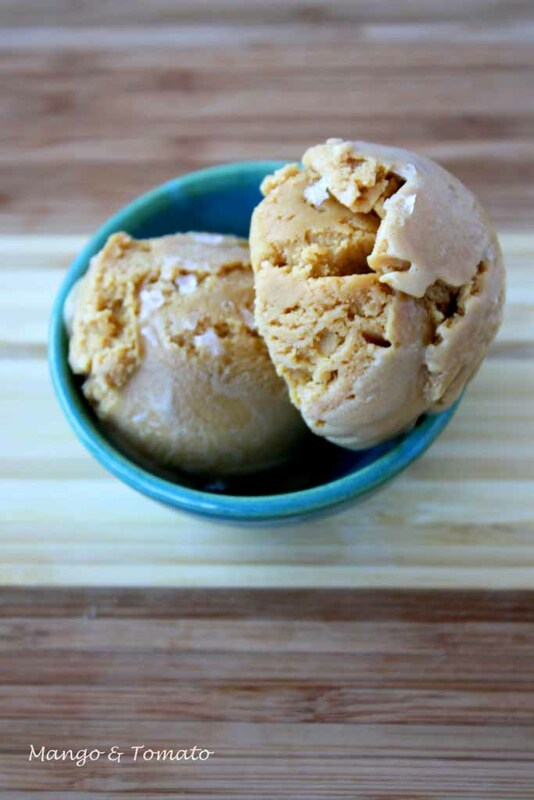 What are some of the unusual flavors of ice cream you've tried lately? OMG yum!! There is an ice cream shop in Seattle that has salted caramel ice cream and it is my absolute favorite! Seriously, it's to die for. 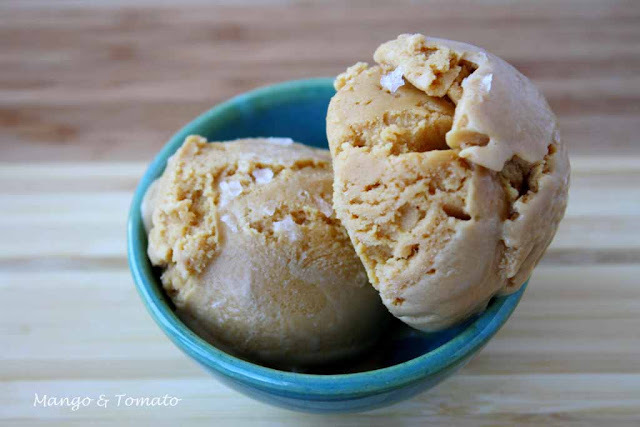 I am saving this recipe for the day that I buy an ice cream maker! 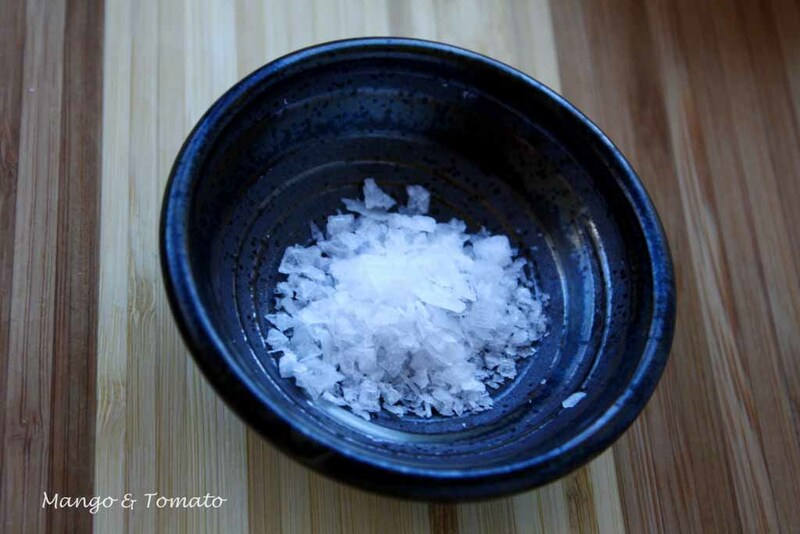 Beautiful flavour, and so pretty with the salt crystals on it. I dont tend to like trying strange flavours. I guess i'm not the most adventurous foodie. I like my ice cream sweet and simple. I guess the strangest flavour i've had was olive oil at a Mario Batali restaurant in NY. In all honesty, I just wasn't feeling it. Salted caramel anything is delicious. You should've sent some this way. Salt just makes food scream! I am always looking to make different kinds of ice creams for my kids. They love to eat ice creams. I found here a wonderful recipe. This sounds and looks delicious. Salty ice cream is appealing in a weird way. i LOVE this idea. how clever and what a good mix of flavors. we have a gourmet popsicle guy here that does sea salt and chocolate but i should tell him this idea.